Retired 40-yr USDA-Agricultural Research Service research soil scientist. Lives on family farm north of Ranger, Texas. Research experience. B.S., Abilene Christian College; M.S., Ph.D, Iowa State University. Post-doc. University of Minnesota. USDA-ARS scientist at University of Missouri, 9 years; at Purdue University, 14 years; and research leader at Subtropical Agricultural Research Center, Weslaco, Texas, 17 years. Organic production is a holistic system and must be researched as a system. The basic assumption of organic production is: improved soil health results in improved plant health, resulting in a plant with increased resistance to insects and diseases. The primary benefit of organic production is human health. Equally as important are farm worker safety, plant and animal health, soil and plant health, disease and insect control, and environmental issues. 2) understanding of the interactions among components of the system.Taking a particular successful component within an organic system and applying within a conventional system will fail. For example, compost tea to control diseases. 1) Increase soil organic matter. 3) Balance soil microbial populations. 4) Disease control through improved soil health +. 5) Insect control through improved plant health +. WHY LACK OF ORGANIC PRODUCTION RESEARCH? 1. Lack of financial support from state and federal institutions. 2. Little financial support from organic industry. 3.Difficulty in designing long-term experiments with multiple factor interactions. 4.Government institutions insist on study of components instead of systems. Failures are related mostly to facilities, lack of funding, and administrative management (lack of interest). First, a history of the Weslaco organic program. In summary, lack of interest in organic research due to funding and several new Center Directors resulted in organic production research to be discontinued. 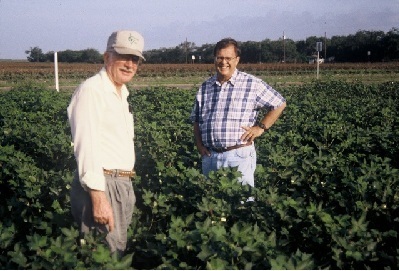 Study initiated in CY 2002 at the Sonny and Noreen pecan farm in Comanche County, Texas, near the small town of Lamkin. Pecan is considered an alternate bearing tree. With the organic system, with time the yield difference between years decreases. Across years and varieties, in general the poulty litter + mycorrhizal fungi treatment resulted in the greatest yield. (Both were incorporated to a depth of 8 inches with an Aer-way plow. In 2008, pecan yield was 6.7 times greater for the Desirable variety and 3.8 times greater for the Cheyenne variety for the organic system compared to the chemically managed orchard. Nut weight and nut quality was always increased by the organic method. Major insect problems: pecan casebearer, pecan weevil, and yellow aphids. Major disease problem: pecan scab. In 2006, a 45.1% yield increase for poultry litter + rock dust + compost tea compared to the top-performing row-zone chemical system. In 2007, the Albrecht chemical fertilizer system had the greatest yield. In 2008, the Albrecht chemical fertilizer system and the Albrecht organic fertility system were the top yielding plots. Conclusion: the organic system takes some time, depending upon initial soil conditions, to result in best yields. During a 3-year study, two treatments, either 200 pounds per acre granular humate or 5 lbs per acre of calcium lignosulfonate mixed into a row-zone chemical fertilizer system significantly increased yields, compared to the row-zone chemical fertilizer system only.